YEGPIN is looking for companies to help support this wonderful event. There are a number of ways for an organization to contribute, whether it is being directly involved by selling your products and services at the event, providing a direct contribution or providing a silent auction item to help support the event. What better way to promote your products or services then to have a booth at YEGPIN. We will have limited, dedicated space for vendors who wish to sell or promote their pinball and arcade products. There will be a maximum of 3 vendor spots available at the show. Cost: Contact sponsors@yegpin.ca to inquire. There is a maximum of 2 spots available at the show for partner vendors. YEGPIN provides a write-up on your company and logo/website on our vendor site. YEGPIN provides a Partner level sponsorship, with logo (and electronic link) appearing on all Electronic (Website and Social Media) in addition to all External and Event printed advertising and promotional materials for YEGPIN. 1 minute ad on pinball tournament streams. 6 customized all access Vendor Passes will be provided. 30×30 space, tent, tables and chairs can be provided and space for up to 15 machines. Option to add additional naming rights for major or minor events during YEGPIN. YEGPIN provides a smaller write-up on your company and logo/website on our vendor site. YEGPIN provides a Presenting level sponsorship, with logo (and electronic link) appearing on all Electronic (Website and Social Media) in addition to all External and Event printed advertising and promotional materials for YEGPIN. 30 second electronic ad on pinball tournament streams. 4 customized all access Vendor Passes will be provided. 15X15 booth, tent, tables and chairs are provided and space for up to 8 machines. 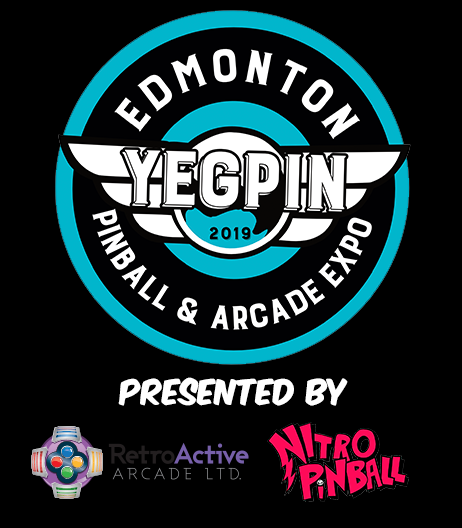 Associate your company name with YEGPIN – 2019 Edmonton Pinball and Arcade Expo. Anytime the event is shown in advertising, in print, online or at YEGPIN, your company name will be highlighted as being a major sponsor. We will also have a special sponsor section dedicated on the website and a banner created at the event with all of our companies that contributed to make this show a success. Given the high price of radio, billboards, and print ad’s this is a fantastic chance to hit a captive passionate audience. $1000 “Gold” Sponsors: – Sponsors, with logo (and electronic link) appearing on all Electronic (Website and Social Media) in addition to all External and Event printed advertising and promotional materials for Expo, and a choice of a sponsorship package. $500 “Silver” Sponsors: – Sponsors, with logo appearing on all Electronic (Website and Social Media) in additional to all External and Event printed advertising and promotional materials for Expo, and a choice of a sponsorship package. 10 second electronic ad on pinball tournament streams. $250 “Bronze” Sponsors: – Your organizations name appearing on Electronic (Website and Social Media) advertising, and a choice of a sponsorship package. ~ Vendor passes include full weekend access to the event including Nitro Pinball – Friday Night VIP Party and Retro Active Arcade – Saturday Night Retro Arcade Party (YEGPIN After Dark). ~ The higher the level of sponsorship the bigger the size of the logo on website and event banner. ~ Cash equivalent sponsorship (goods in lieu) will be recognized at a 75% cash value. ~ Contributions less than $250 will be recognized on our website as “supporters”. Please email sponsors@yegpin.com for more information on vendor space, donations or sponsorship for the event, organizations must contribute before March 1, 2019 in order to have their logo attached to any of the promotional materials.